At the age of 20, Maryam came to the HAGAR Transitional Care Centre (TCC) in Kabul city, following a lifetime of abuse and suffering. Born to a refugee mother who died during childbirth, Maryam spent her childhood in Iran and Afghanistan after being adopted by an aunt and uncle. From the tender age of nine years old, a family friend and her uncle sexually abused her. Maryam suffered in silence until she could not bear it anymore and escaped. In her attempt to run away, she encountered a driver who was on his way to Kabul. Wanting to take a chance at a new life in the city and knowing how difficult it is for women in Afghan culture to live independently, Maryam decided to stay with the man’s family and become his second wife. Throughout her five-month stay in the man’s household, she was sexually and physically abused. In addition to this, his extended family were not pleased by Maryam’s presence and sent her death threats, eventually forcing her out into the world alone and adrift. With no one else to turn to, Maryam found the UN’s refugee agency (UNHCR), which then referred her to HAGAR. Since arriving at TCC, she has only gone from strength to strength, re-entering the school system many classes above where she left off, and winning first place in her exams last year. When she arrived, she didn’t even know the alphabet. Now she is not only literate in her native language but is also studying English and German. HAGAR has been honoured to be able to celebrate these successes with her. Maryam has utilised all the opportunities at TCC to further her education. She now has a five year plan for herself and her education, whereas previously she could barely see beyond surviving each passing day. At the TCC in Kabul, HAGAR provides victims of abuse with access to education, vocational skills and employment, helping them to improve their lives in long-term and sustainable ways. 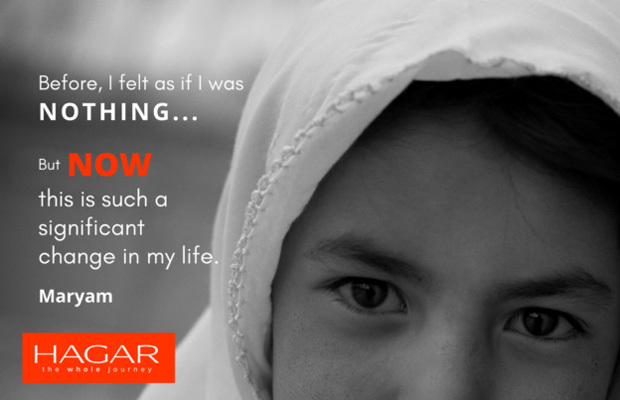 Your consistent support of $50 monthly would help give women like Maryam the chance to flourish and lead dignified and empowered lives.